Daniel Goulden reviews a book "so good it hurts to read." In November 1939, the Soviet Union invaded Finland in hopes of annexing Karelia, a strip of forested lands on the border of Finland. It wanted Karelia as a buffer to safeguard nearby Leningrad. Finland fought back fiercely, but ultimately had to surrender portions of its Eastern Lands. Two years later, in June 1941 (when the Nazis broke the Molotov-Ribbentrop pact), Finland was trapped between two authoritarian regimes. Allying itself with Nazi Germany, Finland entered the war against the Soviet Union and attempted to regain the territory lost during the Winter War. 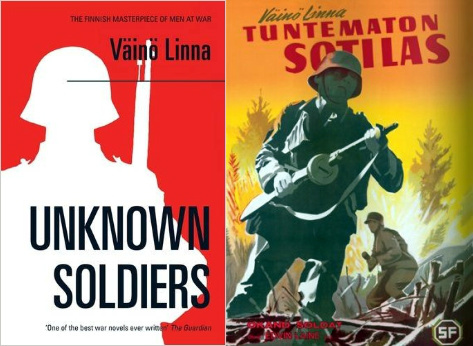 The novel Unknown Soldiers by Vaino Linna presents the morally ambitious events of the Continuation War. The story follows a company of soldiers, some excessively patriotic—and others considerably less so—as they march through the forests of Karelia. The perspective seamlessly switches from character to character, so the reader witnesses the war from multiple perspectives. Despite their differences, each character quickly realizes that the war is horrifying and pointless. The only characters who do not realize this ostensible truth of war are the deluded officers, more concerned about medals and careers than the lives of their men. As the novel progresses, we learn more about these soldiers, and we begin to feel the same bonds of camaraderie they feel towards each other. There is Koskela, their commander, who does not care about his promotions but only the wellbeing of his men; Lahtinen, the communist, constantly preaching about the proletariat; Rokka, a fast talking insubordinate with the uncanny ability to crack jokes as he takes out enemy machine guns. Linna’s capacity to make these men feel like friends cuts hard when we see the horrors they must endure and the deaths they inevitably face. To Linna, war is a universal horror, and nationalism is nothing more than a tool used by the powerful to trick young men into fighting (and ultimately dying) for a country that cares more about its land than their lives. Unknown Soldiers forces English-language readers to reflect not just on Finland’s actions during World War II, but on their misguided patriotism.. In this sense Linna has written a national novel that transcends national borders. In translation, Linna’s novel takes on greater complexity. Translator Liesl Yamaguchi successfully transfers the uniqueness of each soldier’s dialogue into English. Some characters are country bumpkins who speak with strange accents and talk in circles. Others speak with an arrogance that slowly degrades into sarcasm as the war goes on. One soldier totes a bow and arrow to annoy his superiors, speaking with a ridiculously over-the-top nationalist air. Yamaguchi is even more successful in capturing the sarcasm and cynicism of Linna’s narration. This is how a beloved character dies: “His body shook for a long time as a shower of machine-gun fire tore through it. [The Sergeant] was a happy-go-lucky kind of guy.” The prose is short, direct, and to the point, and Yamaguchi renders it into an English so good it hurts to read. The Soviet Union didn’t want just “strips of land”, Stalin wanted the whole Finland. Just look what happened to the Baltic countries that were annexed and their population deported, Finland would have suffered the same fate. Also most Finns knew that all throughout the 1930’s Stalin had been deporting Ingrian Finns to forced labour camps in Siberia (and elsewhere) where few survived, and Karelian Finns had been heavily targeted during the Great Terror just a couple of years earlier, they had been mainly shot by NKVD. It was simply ethnic cleansing. So even though some were literally fighting for their own land (relocating 420,000 people or 11 % of the population who had to leave everything behind is no small feat, not to mention what losing all the farms and factories in that area and also the second biggest town meant for the people, the economy and agriculture), Finland and Finns were also fighting for their own survival. Losing the war would have meant becoming occupied and losing independence. If that had happened, a lot more Finns had died, so they were fighting for their own families, for their children’s future. So maybe they didn’t have “a cause” but there is a reason why there was hardly any resistance movement in Finland and why both Finnish Jews and Communists served their country against the Soviet Union and as co-belligerent of Germany. They all knew that the Finnish democracy and way of life was at stake, it wasn’t just for “a small strip of land”. It is a miracle Stalin only got that when he had been after a lot more but fortunately he failed. Maria is correct in her description. The leadership of Finland was informed in 1941 about Operation Barbarossa. However, they didn’t “ally” themselves with Germany, but inofficially stated, that if the Soviet Union attacks, Finland will fight. The Soviet Union promptly started to bomb Finland directly after the German attack. First on the 22nd and up to 24th of June 1941, with limited raids. On June the 25th the Soviet Union attacked 27 municipalities with 500 bombers. That was the day Finnish Parliament was going to declare neutrality. Instead, after the bombing, the Finnish PM noted that Finland is in a state of war with the Soviet Union. However, as Finland knew about the German plan, it had mobilised its armed forces and placed them in a defensive formation. And now to the start of the book. The start of the book describes a conscript company, or actually mostly a platoon of it, that is transferred from barracks to wartime readiness. Later after their baptism of fire, they start to get refreshment personnel to replace the fallen. On the first reading the multitude of characters with strange (Finnish) names may seem to be hard to follow, but each soldier has his own character, and possibly a second reading will start to open up the uniqueness of each character. This is a great book very much worth to read. As the rewiever notes, it transcends national borders.